Everybody, meet Joe. Joe, this is everybody. Joe is a seemingly common name on a common card from a common set. 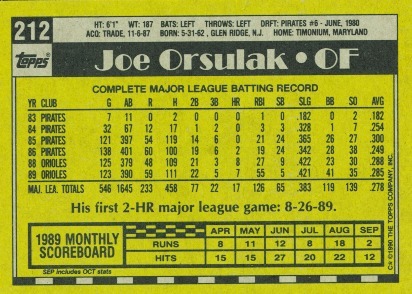 Besides his awesome last name, Orsulak, Joe is nothing spectacular. I mean the card, not the man. His back is even graced with the decidedly dull card number 212. Unless you call people that live or work in the borough of Manhattan, or you really like the boiling point of water, let’s face it, this number rarely ever makes an appearance in your life. Two hundred twelve is lifeless. Now, you're probably asking yourself, "Why is this card relevant to my interests?" It's probably not, but this card means something to me. You see, back when I was an acne riddled, voice squeaking, gangly 14 year old, I counted my cards. After a week full of school, practices, games, ballroom dancing (yeah, you read that correctly), I would take a box of cards into the family room, plop down on the ivory white sectional, turn on Mystery Science Theater 3000 and count my cards into the wee hours of the morning. During one of those weekend rituals, I came to a watershed moment for a teenage collector who had started out with a handful of cards, sorted by team, wrapped with rubber bands and stored in an old Vans shoebox. I was approaching the 25,000 card mark. It was an almost celebratory moment when I hit 24,900 cards with a pile of 200 or so more cards in my collection to count. I was going to crest the 25,000 card mark, and I wondered, who would be the 25,000th card? Would it be Canseco? Gwynn? Ryan? I quickly began counting the cards and as I approached the milestone, I remember getting giddy. Giddy is not something a 14 year old boy should get, which likely explains the severe drought of dates in high school. Anyways, as I counted 24,999, I shuffled the card over and saw Joe. Average Joe. Common Joe. I was surely less than thrilled, but I set him aside and placed Joe into a penny sleeve as his humble reward for being card 25,000 in my collection. 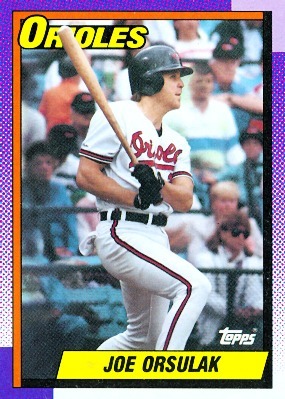 But, I eventually grew to love that card, and whenever I see a Joe Orsulak, I always think of that evening. I’ve loved that card so much, that I feel I must set Joe free from my card closet and send Ordinary Joe on an epic adventure. This adventure has two purposes: 1. To see what is the best card(s) I can receive for Standard Joe in what could be a seemingly never ending series of trades and 2. To see where Typical Joe goes through other people’s trades. To accomplish this, I am placing Usual Joe into a top loader and posting him as trade bait. Whoever makes the best trade offer for Joe after one week of posting will win Joe. Then I’ll take whatever I received for Joe and post that as trade bait, and so on, and so on. The other part of this adventure will require feedback. I plan on placing a note inside Joe’s top loader. This will be similar to Where’s George, the money tracking website. The note will instruct that person to email me and let me know Normal Joe’s location and what you sent/received for Joe. As long as Joe is in circulation, I will post his whereabouts. 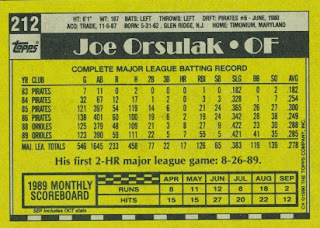 So, who wants a 1990 Joe Orsulak #212? Best offer by 9:00 PM EST June 15th wins! This could be like the Flat Stanley (http://en.wikipedia.org/wiki/Flat_Stanley) of baseball cards. Cool. I agree with the geocache! I leave baseball cards in geocaches all the time.